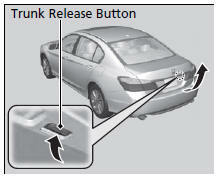 Push up the release button on the trunk lid after the doors are unlocked. Even if the trunk is locked, you can open the trunk if you carry the smart entry remote. • Do not leave the smart entry remote in the vehicle when you get out. Carry it with you. • A person who is not carrying the smart entry remote can unlock the trunk if a person who is carrying it is within range. • Do not leave the smart entry remote inside the trunk and close the lid. The beeper sounds and the trunk cannot be closed. • Do not carry the smart entry remote near the trunk lid when closing it. • Do not place the smart entry remote around the rear seat when closing the trunk.